The original B.M.C. Audio MCCI phono preamplifier earned very positive reviews when it was introduced in 2013. Carlos Candeias used his designs for the $1400 Aqvox Phono 2Ci, reviewed here on 10 Audio, and introduced a much-upgraded model as the MCCI under his own brand, B.M.C. Audio. The MCCI ($3890) was replaced with the MCCI Signature ($4298) in 2016. The model under review today is the MCCI Signature ULN ($4690) which hit the market in March, 2018. B.M.C. Audio builds large numbers of each model at one time, which offers significant savings on cost of the parts used in the manufacture. Because of this, it is not reliable to compare B.M.C. products to others based solely on price. The solid-state MCCI Signature ULN, for Ultra Low Noise, offers 16 dB less internal noise at 100 Hz, narrowing to under 2 dB less noise at 700 Hz and above, improving on the already very quiet Signature model. The frequency of Middle C on a piano is 262 Hz, so the additional noise reduction is significant and benefits almost the entire midrange. Other components on hand during the audition include a VPI Aries 3 turntable with a Kuzma 4-Point tonearm, ZYX UNIverse Premium and Miyajima Madake moving coil cartridges; B.M.C. MCCI and Pass Labs XP-25 phono preamplifiers; custom Windows 10 music computer running JRiver Media Center; Bryston BDA-3 DA converter; RME ADI-2 Pro AD/DA converter with external power supply; Pass Labs XP-22, Wyred 4 Sound STP-SE-2, and Acoustic Imagery Jay-Sho preamplifiers; Cary CAD-805AE, First Watt J2, PS Audio Stellar S300, Valvet E2, and Pass Labs XA30.8 power amplifiers; Focal Sopra 1 and Fritzspeakers Carrera BE loudspeakers with the lowest few Hertz supplied by a pair of JL Audio e110 subwoofers, and Focal Chorus 714 loudspeakers borrowed from the HT system. The audio cabling is Audioquest WEL Signature and Mogami interconnects and speaker cables. USB cables are Straight Wire USB-F. Power cords include my DIY power cord and Straight Wire Pro Thunder. Power protection and purification are provided by a PS Audio Dectet for the preamplifiers and source components, and a PS Audio Quintet for the power amplifiers. The Quintet provides remote turn-on and -off of power amplifiers that lack a 12V remote trigger. Both cartridges used in this review are low output moving coil cartridges. The Miyajima Madake has a DC resistance (DCR) of 16 Ohms and offers about 0.23 mV output. The ZYX Universe Premium has a DCR of 4 Ohms and 0.24 mV output. Although the voltage output of both cartridges is similar, the different DCR values is a good test for the ability of the B.M.C. phono to support a range of modern moving coil cartridges. In the image above, the left two circuit boards are all power supply. The matching circuit boards in the right half of the chassis are the left and right channel amplification. There are a lot of very close tolerance and expensive parts which produce, basically, a 4th generation, mature design. The MCCI is a current amplification device, unlike voltage amplification used in most preamplifiers. This technology eliminates the common concerns regarding selecting the correct resistive loading value for your cartridge. This is just one of several important advantages of current amplification for a moving coil phono cartridge. The output stages are run in single ended class-A configuration. 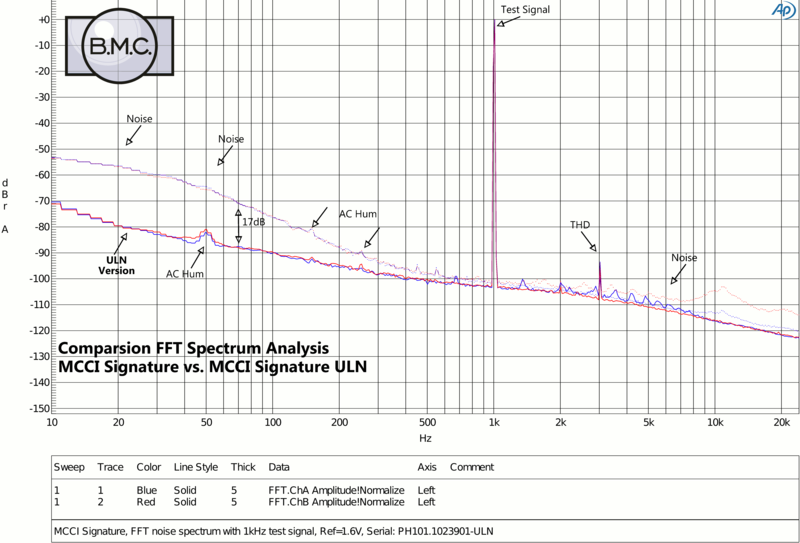 The MCCI ULN provides internal settings for overall gain, subsonic filter, and Neumann or RIAA equalization, but no options to change resistive loading. This does not seem to be a problem on any relevant level. The Medium gain setting works very well and closely matches the output from the DACs above. A momentary “downer” for a new owner is not finding a Torx T-15 screwdriver included in the box with a new ULN. This screwdriver is required to remove the ULN’s top panel to change any of the available settings. A special consideration for the MCCI is that the inputs are balanced XLR only, while both XLR and RCA output connectors are provided. As long as your phono cables do not connect the phono cartridge ground terminals – the blue and green ones – together to the separate phono ground wire, there is no problem. If your phono cables have RCA connectors, you will need commonly available RCA-F to XLR-M adapters. The entire MCCI is balanced, just like phono cartridges, from input to output and prefers this connection to your preamplifier. Warning: Do not judge the sound of the ULN when brand new, out of the box. The unit must receive – and you must endure – at least 100 hours of use before the ULN starts to sound good. At the 200 hours-of-use milestone, break-in is nearly complete and the unit is ready to enjoy. There are further apparent gains in soundstage size and upper frequency smoothness and resolution up to about the 300-hour mark. I use the locked grooves on the Cardas Frequency Sweep & Burn In Test LP, now in version 2, for this tedious chore, cleaning the stylus frequently. The optimum method to break in a new phono preamp, which saves wear on a phono cartridge, is to use a reverse-RIAA adapter with volume control and use a tuner or CD player as the signal source. However, that method could not be used because of the requirement that signal grounds are not shared between channels of the source. The original B.M.C. MCCI was/is a special device. Everything which the “plain Jane” original MCCI does, the new MCCI Signature ULN does better, mostly because of higher resolution due to the lower noise of the ULN model. The soundstage benefits greatly on the ULN model, being much more specific with more precise localization of the musicians on a noticeably larger virtual performance stage. The dynamic power is also noticeably improved over the original. One thing that both models have in common is that huge round knob in the center of the front panel. It is the On-Off switch. One thing the older and newer versions do not have in common is a binding post for the ground connection, which is MIA on the ULN. The removable rear panels would help make installing a binding post a simple task, if desired. Curiously, the older MCCI sounds warmer and more relaxed, probably due to the increased resolution of the ULN not getting in the way. Think of the MCCI’s sound as a nice, cozy blanket, while the ULN strips away the blanket and you connect directly with the environment. This is not an effect of highlighting the upper midrange and lower treble, but actual clarity and resolution. Very low-level detail is much more discernable with the ULN model, effectively elevating the performance of a phono cartridge to a higher model in that manufacturer’s product line. Cool! The ULN’s bass is also more powerful than the non-ULN phono stage, making it competitive with the stellar bass performance of the $10,600 Pass XP-25. However, from the midrange to upper treble range, the ULN offers a clarity and stunning harmonic depth that exceeds the performance of the XP-25. The ULN does a better job of getting out of the way and letting the music through. The improvements in clarity and natural sound become greater as frequency increases. When we hit the treble range, the ULN leaves the XP-25 far behind. This is not a subtle difference between the two products, but one that is heard and appreciated in very short order. Using our scale of sonic differences, there is a Large difference between the sounds of the XP-25 and the ULN, all to the ULN’s benefit. The MCCI Signature ULN offers a totally complete and natural presentation. At this level of music reproduction, we are past needing to talk about bass, midrange, treble and soundstaging abilities. All of that is a given. Now we are enjoying nuance, delicacy, penetrating resolution, and “draw me in” involvement. This presentation delivers the two requirements for exceptional music reproduction: ultimate resolution and unwavering linearity of that resolution across the entire audible frequency range. The MCCI Signature ULN meets these requirements 100%. The rest of the judgement of quality in any sonic area is this: system synergy. When used in a generally neutral system at any price or performance level, the MCCI Signature ULN could challenge other components to keep up. Digital will never sound this good. This would be an ideal component for an old-fashioned overnight audition. Just one evening is plenty of time to understand just how good this phono preamplifier is and provide confidence that it will deliver enjoyable music for you for a long time. There are a couple of setup issues to address, as noted above, but these are just details, and compliance is usually simple. While I enjoyed the performance of the world-renowned XP-25 for a couple of years, the B.M.C. MCCI Signature ULN has elevated the sound quality of my LP playing system to a new, higher level and takes it rightful position as the latest phono preamplifier to attain long-term reference status. It’s a keeper! This review would not have been possible without the kind support of importer Brian Ackerman of Aaudio imports. Thank you, Brian! Thank you so much for liking our MCCI Signature ULN that much! I'm happily adding some more details, as well as some background information. The first CI (Current Injection) phono amplifiers we indeed made in 2004 for CEC (PH53) and AQVOX, actually from the first design scratch to until the ready packed unit. The analog revival just started off and specifically the AQVOX was sold in large numbers, proofing that a phono preamplifier can be more than a manufacturer's secret love and hobby. Those two models were based on our universal amplification module CC80, which was also used in CD players, DAC, preamplifier... C80 performs much better than any operational amplifier chip and surely did a great job for the first CI phono stages, but actually it wasn't specialized on the requirements of a phono preamplifier. Since we do audio design and manufacturing since 1986 and had more resources than most audio brands, except an own brand, B.M.C. Audio was founded in 2009. The idea of making a highly specialized CI amplifier module, just for the use with MC cartridges, plus the collected experiences from the first two approaches, were the foundation for the first MCCI phono preamplifier then. Regardless of the fact that the price won't be at jewelry level, we wanted to build simply the best phono amplifier available. - Transparency, dynamics and musical flow are on a higher level. - In spite of the above, users also report a more relaxed listening with less fatigue. After considering the MCCI to be hard to improve the new MCCI Signature provides more improvement than considered possible. You don't need any "golden ears" for immediately experiencing the advantages. ULN: Sometimes the planning of product scheduled gets messed up by a sudden idea: We were upgrading lots of original MCCI from customers to the "Signature" standard. Some showed a slight downgrade in low frequency noise (RIAA has the highest gain there) due to some part ageing in some references. Just replacing the part was unsatisfying and at 1 a.m. the solution was there to solve the problem by circuitry. This also promised to force a larger part of the noise into common mode (get cancelled by balanced circuits), but we never expected that incredible improvement! The sound actually didn't change compared to the "MCCI Signature" but since the background was not "dark grey" but "black black black" the impression anyway changed to clearly better. Look the the comparison sheet below. How could we hide this in the drawer until the next strategically matching product release? Current Injection's biggest advantage is actually that the weakest point of a phono amplifier, voltage amplification of tiny signal voltages, has been turned to a virtually lossless stage. The original MC cartridge current is preserved and used for making the first amplified signal voltage. In addition we got a passive quality RIAA filtering, without the need of excess gain. This preserves much more of the original cartridge signal compared to any other circuitry! Please note that CI is not to compare with OP-Amp based current inputs - those don't achieve this! The obsolete cartridge loading is a positive side effect: Strong loading improves detail and control, but reduces dynamics and vice versa. Such a compromise is a contradiction to the high-end-audio aim! CI loads the cartridge very strong, but it uses the generated current completely inside the amplifier for signal generation - nothing is "burned" in load resistors. So CI achieves top control and dynamics! The output stages are working in LEF (Load Effect Free) mode, so single ended call A is a side effect and the voltage output device avoids distortions by not moving at all in it's non-linear characteristic. LEF provides low distortion without an overall feedback loop, better linearity than class A and phase independent output current delivery. Since the ULN version has so much noise headroom actually all MC (also high output MC) cartridges work well with our MCCI SIgnature ULN phono stage. However, a new approach favours cartridges differently compared to a traditional voltage amplifier. For CI amplifier, a high generator efficiency delivers the best electrical result. The cartridge voltage divided by the generator impedance determine the value of current available for injection (the higher the value, the better). Most modern cartridges tend to higher efficiency but some manufacturer still prefer old-style-cartridges (with thin wires, lots of windings and weaker magnets), caring the voltage only. The most extreme concerning efficiency are the cartridges from master Matsudaira: MY Sonic Lab (Signature Gold) and Haniwa (HCTR01). The Transfiguration Orpheus (0.7mV version) and the Lyra Atlas are joining the above group. All other newer Lyra's are also a top-grade match. All non-historical Ortofon match perfect too as well, and many more. MY Sonic Lab (Signature Gold): 0.5mV / 1.4 Ω = 357 μA. Transfiguration Proteus: 0.2mV / 1Ω = 200 μA. Most Benz-Micro, Van-den-Hul and Clearaudio cartridges are not an optimum choice for CI operation due to too old generator design, although some few Benz models (e.g. high output types) are different already. Anyway we have happy Benz Micro users with the MCCI. We suggest to target cartridges with more than 50μA of current. *All values without respect of the inner voltage damping! When connecting a cartridge to a load the above values differ more or less, depending on the generator design. Cartridge manufacturers would help a lot by specifying the voltage e.g. 0.25mV@100Ohm, 0.2mV@4Ohm, which would also help to match step-up transformers, too. Specifically the "super efficient" group takes perfect advantage of a CI phono stage. Matsudaira is trying to match step-up transformers (critical due to inductance) and Haniwa applies a super heavy loading for matching those cartridges (failed! ), which is obsolete with CI. Those cartridges really blossom with a CI phono amplifier. Hopefully this comment is not too much and interesting for you readers. Nevertheless: Hearing is believing! Wish a lots of enjoyable listening sessions!